It has been quite a while since Europe got a new tourist destination, most are classics that people have traveled to for years. But Ksamil just started to gain more visitors in recent years. 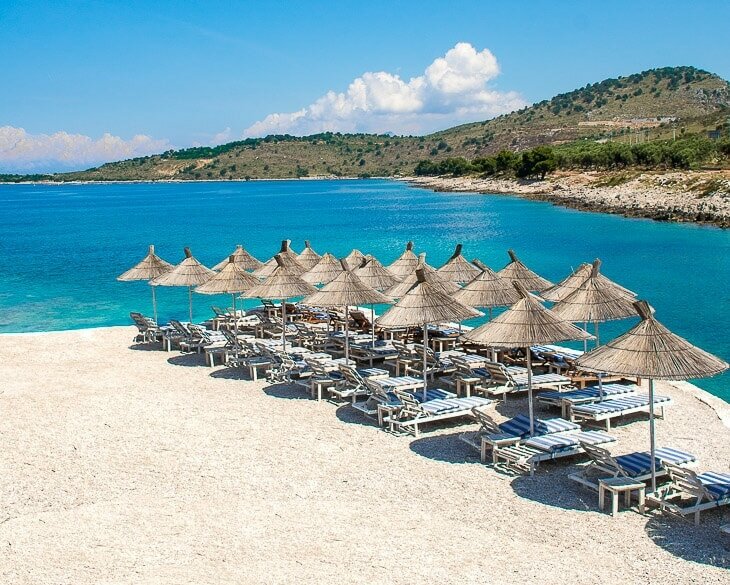 This hidden gem is located on the Albanian Riviera, and it sure is one of the best beach destinations in Europe. What to expect? Once in Ksamil, you can enjoy Paradise beaches offering white sand and crystal clear water with a Mediterranean climate year round. I went here earlier this summer and instantly fell in love. Below you can see some photos and tips on accommodation, how to get here and the top things to do in Ksamil. Below you can see some photos and tips on accommodation, how to get here and the top things to do in Ksamil. This photo below is taken at a secluded place just around the corner from the busier beach are above. We found this little place with two sunbeds and two pedals. In short – The perfect way to have a romantic and joyful day on the beach. Ksamil is a small village in southern Albania. Locals have long gone here in the summer for sunbathing and swimming, but it is only now in recent years that foreign tourists have found their way here. Several charter companies offer trips to Ksamil, but it’s just as easy to get here on your own. 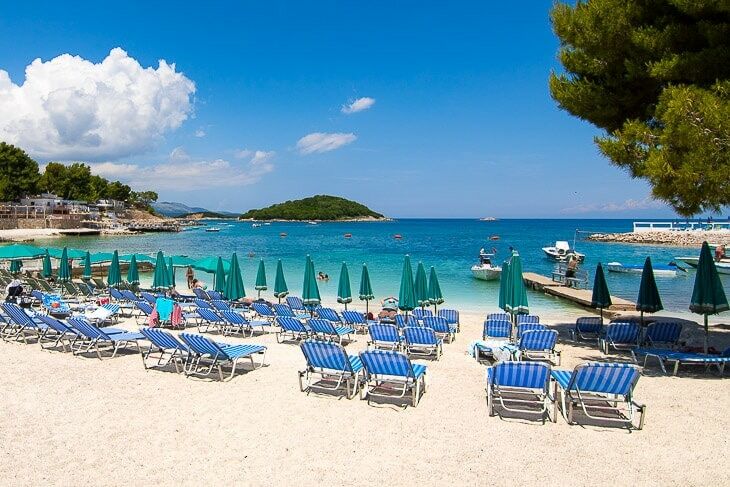 Ksamil is primarily known for its fine sandy beaches and crystal clear waters. Especially on the four islands located a bit out in the water. These four islands are uninhabited, and you get to them via boat. In the village lives about 4000-5000 people and tourism is increasing every passing year. However, there are still plenty of secluded places left if you are looking for peace and quiet on your holiday. The village has also retained the charm to some extent, and there are plenty of cozy little restaurants serving Albanian cuisine. The hotels are also no big resorts and are instead most part family-owned hotels. The trip to Ksamil is smooth and easy. The flights go to Corfu in Greece, located approximately 30 minutes away from Albania by boat. To land at Corfu airport when traveling to Ksamil is really like a regular shuttle since it’s just a short transfer. The boat stops in Saranda and from there you either take a taxi or bus. A taxi from Saranda to Ksamili costs about 10 Euros, and the bus costs 100 LEK (approx 0.70 €). The boat trip costs about 10 Euros. Several charter companies offer trips to Ksamil, but it’s just as easy to book your trip to Ksamil on your own. Direct flights go to Corfu from many destinations around Europe and from there it is, as I said just a short boat ride before you have arrived in Albania. Whether you go charter or on your own, you still fly to Corfu airport. Another option is to fly to Tirana and from there take a cab or bus. But this is more expensive and also takes a longer time. A three-star hotel in central Ksamil that has everything one could possibly need for a nice vacation. Two Mermaids Hotel has nice rooms with air con, and the staff is friendly as well. A restaurant is available at the hotel. If you’re looking for a genuine stay and a family owned hotel, then Villa Ideal is indeed the ideal accommodation in Ksamil. The family who owns this hotel are so friendly and helpful. The rooms are also nice and the price per night is really affordable. Saranda is the largest city in the southern part of Albania. This is where the boat from Corfu stops and many locals are living here. It is not a typical tourist destination such as Ksamil, but here you get the chance to experience daily life and Albanian culture. To stroll along the harbor and the seaside is also nice. Along the boardwalk, one will also find a couple of cozy restaurants and bars that serve good drinks. A beautiful natural phenomenon which is about 50 minutes drive from Ksamil. 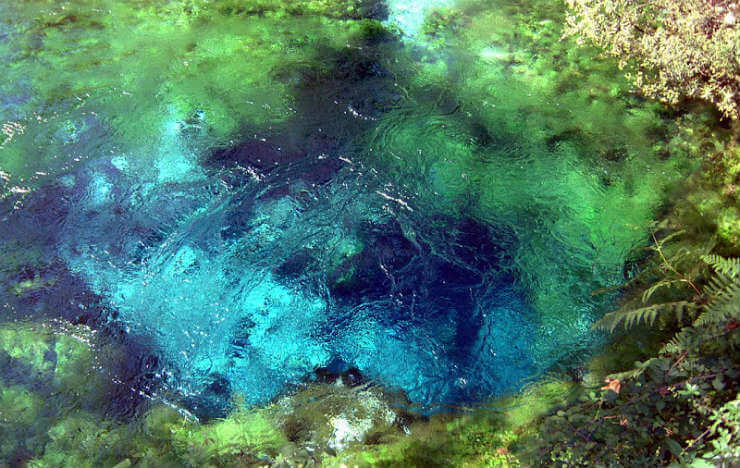 Syri I Kalter is also known as the blue eye and here await crystal clear waters in turquoise and green. The easiest way to get here is by car, but there are also guided tours. 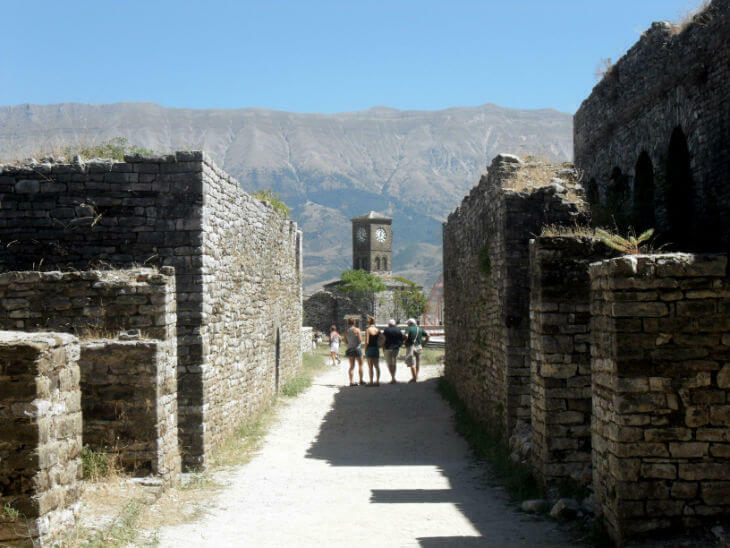 However, by car, you can also visit other attractions in the same day such as Butrint or Gjirokaster. An ancient city in well-preserved ruins that are also on UNESCO’s list of World Heritage Sites. 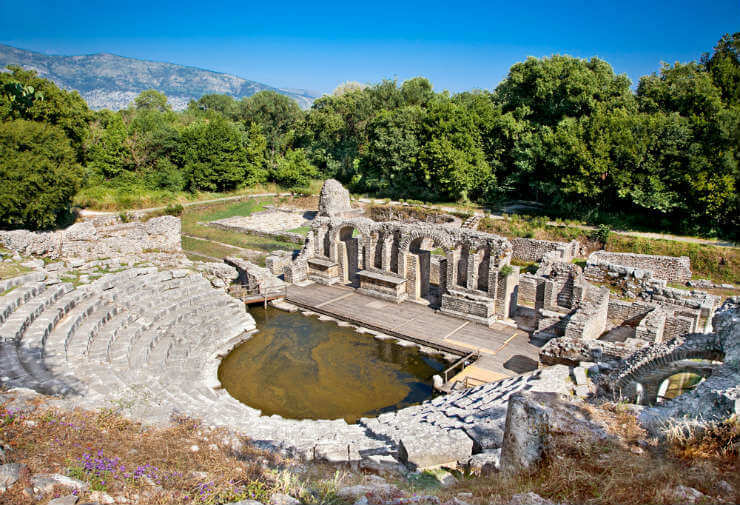 In Butrint, one can look at an old amphitheater, monastery, watchtowers and a fort. Butrint is about 20 minutes away by bus Ksamil. For those who feel hearty, you can also stroll along the olive groves – A walk that takes about 1 hour. 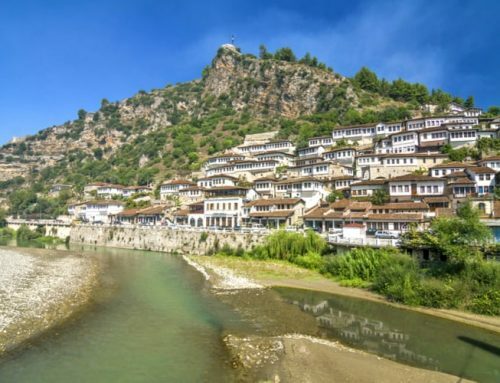 Approximately 2 hours by car from Ksamil lies the historic town of Gjirokaster. This city is as well on UNESCO’s list of World Heritage Sites. The main reason for this is the old fort perched on top of the town and the traditional stone houses. 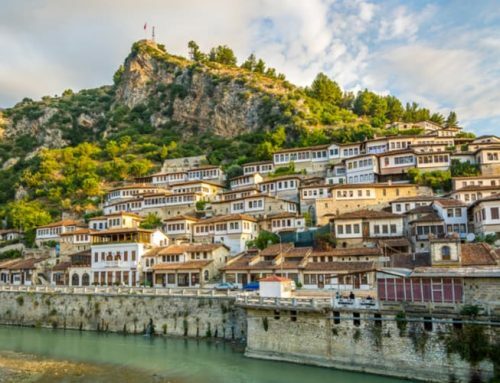 Gjirokaster is a nice day trip where you can stroll around the ancient alleys and learn more about the Albanian culture and history. The easiest way to get here is by car, but there are also daily minibusses from Saranda. Beach Bar Restaurant Korali – Luxurious and good food. Brother’s Taverna – Good food and low prices. 3 Gjiret – Nice restaurant. Guvat – A bit expensive, yet delicious. I am from ksamil, an indipendent promoter of tourism here, nice article for my place, thank you! PS. For more information you can visit our web http://www.ksamil.al and what else I want to suggest is to try Mussel Tour that we organize on lake of Butrint. Thank you :) Glad you liked it. I will have to try that the next time I visit Ksamil and Butrint! Hallo! We are motorhome guests. Do you have any camping there? We are from Tasmania (Australia) and are staying in Ksamil at the moment (and for another 2 weeks). We agree with you – it is most definitely a great little place with lovely beaches, stunning coastal views, amazing mountain scenery in the other direction, and really friendly, polite and helpful people. The weather here is surprisingly mild for this time of year (we have already been swimming a few times) and being outside the main tourist season, it is peaceful, quiet and very relaxing. We highly recommend it as a travel destination when in this part of the Balkans, and intend to return on a regular basis. 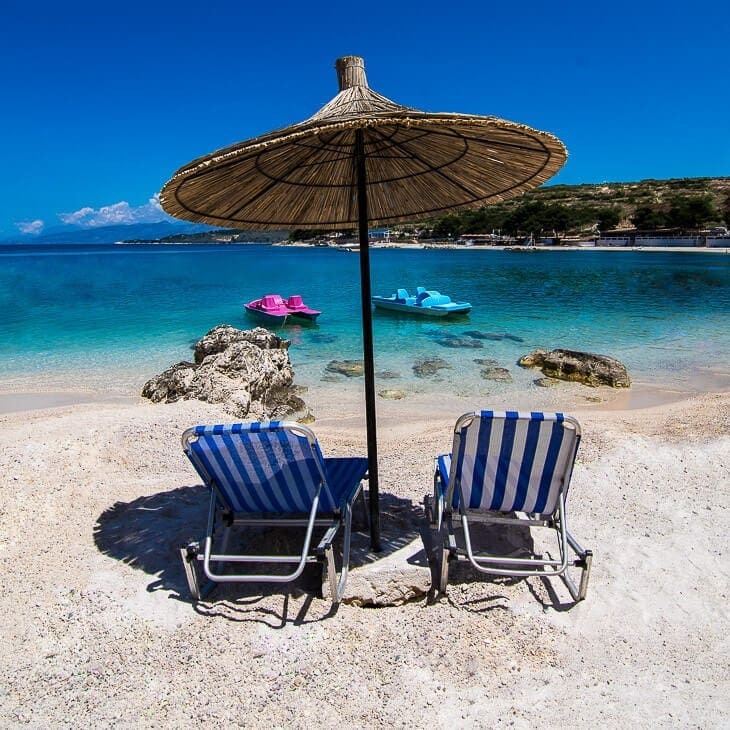 Ksamil is The best destination to visit in summer ,if you come in Ksamil I suggest you Hotel Villa Qendra , summer is comming you are welcoming . Same! We attend to go there at the end of august – 25-th maybe. We have already been in Albania 4 years ago but in Duras and now we would like to explore another part of this magic and unknown country. How is the weather there in October? Or is most of the hotels and restaurants etc closed for the season in October. The weather will still be quite nice during the days, but night temperatures will be a bit colder. Hotels and restaurants are starting to close during this period, if not earlier. But some will remain open and you can still enjoy the beautiful beaches without the summer crowds. Also, don’t forget to mention that there are no public beaches and you have to pay for a sunbed 1000+ albanian lek! Thanks for the added information. It wasn’t like that when I visited. Is this a recent change? and is it effective for all beaches in Ksamil? Are there any beaches where you can sunbath naked?